It’s been a rough half-million years for the polar bear, so it sure doesn’t help that man-made climate change is driving them toward extinction. According to a model published recently in PNAS, polar bears prospered during cool periods but struggled during warm ones, and their numbers have been declining since an exceptionally balmy period starting 420,000 years ago. That’s bad news (bears) with climate change now melting Arctic ice at unprecedented rates. As polar bears become rarer, they may also be forced to mate with brown bears, which this new study suggests has happened before in the distant past. Modern polar and brown bears can and do produce fertile offspring, but biologists classify them separate species because geographical distance usually prevents the two from ever meeting. In zoos that keep bears in the same enclosure, distance is not a problem. A handful of hybrid polar-grizzly bears (grizzlies are a subspecies of brown bears) have been born in zoos in the Czech Republic, Germany, Israel, Poland, Russia, and Spain, according to the BBC. Lindqvist and her colleagues have assembled the most complete sequence of the polar bear genome yet, and hidden in DNA is an account of the species’ evolutionary past. Knowing how polar bears responded to past climate change can obviously help inform predictions, but the evolution of polar bears has been unusually contentious. Without fossils, scientists can only rely on DNA from wild polar bears. (Not easy to collect, as you can imagine.) The less related two bears, the more different their DNA sequences, which acts as a sort of molecular clock. Plugging the DNA sequences into a computer model also gave researchers an estimate of population size over time, which they matched up to changes in the climate. Polar bears were once thought to have adapted unusually quickly to the Arctic cold, having only split from brown bears 130,000 to 110,000 years ago. This past April, a group in Germany looking at 9116 bases of A, T, C, or G in polar bear DNA estimated the species to be 600,000 years old. 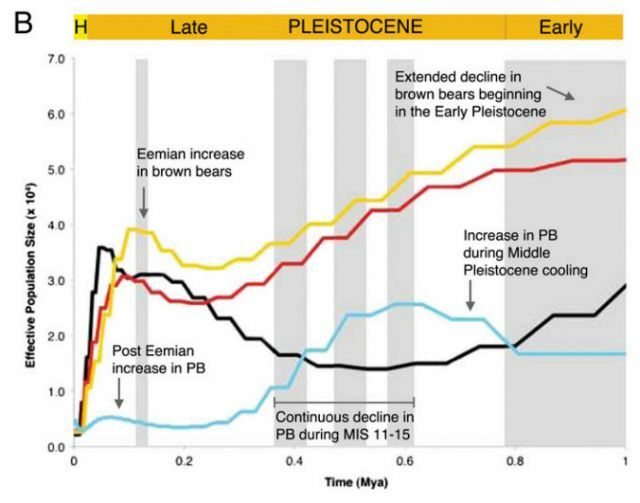 The entire polar bear genome contains 2.53 billion bases, though, and analysis of a more complete sequence in this study pushed their age back to 4 or 5 million years. Polar bears were not especially fast adapters to the icy cold. Historical population of different bear species, including polar bears (PB). Going right along the x-axis takes you back in time. PNAAnd polar bears are unlikely to adapt quickly to the warming climate. The study also found the bears have especially low genetic diversity, which means a smaller possibility of resistance to diseases creeping north with warmer temperatures. Dwindling prey and increasing pollution pile on the challenges. Although the bears have survived past climate swings, man-made climate change happens at a rate never experienced by polar bears. “There’s no guarantee they’ll survive,” Lindqvist says. That’s putting it mildly; the US Geological Survey has estimated polar bears will be mostly extinct by 2050. Thus climate change’s likely impact on polar bears is twofold: Fewer will survive, and the ones that do are likely to mate with the more common brown bears. In 2010, three Arctic scientists writing an editorial in Nature warned of hybrids as growing threat to rare species. Although there is nothing inherently wrong about polar-grizzly hybrids, but it could very well mean the end of polar bears as we know them. Species come and go in the emotionless realm of scientific fact. But Coca-Cola and Planet Earth (see video below) can attest to how polar bears have captured our imagination. Even if a few of their genes survived buried in the DNA of hybrid bears, there’s something tragic about a great white bear found only on Coke bottles and in outdated video clips.